Venom Dagger: A weapon Ärm in the shape of a bracelet that summons a dark green dagger that can poison whoever it cuts, also when he slashes at empty air it excretes a pint of acid like poison that is flung at an opponent and can leave painful burn marks. Vine Whip: A weapon Ärm in the shape of a chain pendant that transforms into a three meter whip with thorn like spikes on it, it can also shoot the spikes when he spins around the whip and they grow back. The thorns grow back one post, but can only be used to shoot every three posts. 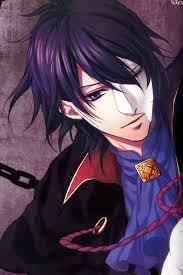 Appearance: Operanus is 6ft tall, has short silky navy blue hair and deep, mesmerizing red-violet eyes. Operanus has healthy pale skin and has a slim build, but don't let it fool you, he is stronger than he looks, he also has sharper than normal teeth, he usually has a unreadable expression with a grin. Operanus is very handsome and has a smooth, attractive, hypnotic voice. Operanus usually wears classy, luxurious looking fancy clothes, they're specially made to be comfortable and ventilated, he also wears silk white gloves. Operanus always wears a mask on one side of his face, he is never seen with it off, it covers the scars of his tortured past. The scar goes over his eye and down his cheek, there's also a burn mark as well, he would never want anyone to see this half of his face, for he is ashamed of it and seeing it or thinking about it makes him angry. Personality: He is highly sadistic, manipulative, and loves to the suffering of others and likes to torture innocent people and his enemies. When he does taunt his victims he talks in a sickly sweet voice, he seldom gets mad or annoyed but when he does his eyes darken and he gets deathly silent which is when he is the most sadistic and dangerous, he loves to intimidate his victims, though just because he’s a blood thirsty sadist doesn’t mean he doesn’t like to enjoy a nice cup of tea, he is also passionate about his work and hobbies, he is very compassionate to the ones he cares about and will protect them with his life he also enjoys just scaring the crap out of random people time to time. He can be extremely passionate to the people he loves and care about, he is enjoys the suffering of his worst enemies, and is a flirt and manipulative when it comes to women. History: Operanus was a simple young man before the second war games, he had a loving family, a loyal fiancee, a honest job, and a beautiful home in the Hild Continent. But he had grievances with the world, the cruelty, the unfairness, the poverty, it made his heart ache with sadness to think about all the bad in the world, but he didn't know of a group that would try to help cleanse the world of the evil. Until the Chess Pieces rose again to start the second war games. Operanus agreed with them, but didn't make it too well known, seeing how so many people disliked the Chess Pieces. Operanus was disappointed that they lost the second war games, in fact his family noticed he became slightly depressed, but they didn't press the matter. One day, Operanus was going on a business trip to Caldia and noticed a small group of interesting characters in the woods, they were injured and obviously hungry. Operanus tended to their wounds and gave them his food, he soon foundout that they were surviving Chess Pieces and they were there to get some Ärms, Operanus immediately agreed to help. Operanus owned an ärm shop, so he went to Caldia to get his inventory, but this time instead of taking the Ärms to his shop he took them to the Chess Pieces, they thanked him and in return they said they'd spare his family and him in the next cleansing. Operanus went back to his house, feeling proud of what he did, him and the Chess Pieces met every month so he can give them Ärms. But one day his family and fiancee caught him in the act, they were furious, in fact the men of the family attacked him to teach him a lesson, they also disowned him and dumped his tattered body in the woods where he soon passed out. When he woke up , the Chess Pieces were tending to his wounds, he asked what happened and was told he was nearly beat to death, one of the Chess Pieces gave him a mirror so he could look at his face, he saw the horrible scar and was filled with intense fury and sadness and threw the mirror onto the ground, he covered the scarred side of his face, claiming he was betrayed, now he was ugly, the Chess Pieces gave him a mask to cover up the scar. From that point on Operanus made up his mind: The world was a cruel and dirty place and must be cleansed, and joined the Chess Pieces. Okay, so far so good, one last thing to fix: Just need yah to say howmany posts it takes for the thorns to come back, and then you're good.